Apostrophe Catastrophes: No Hiatus for Bad Punctuation in L.A. The errant apostrophe in the middle of the word "hours" is the most glaring mistake here, but there's also some random capitalization and lack of periods going on. I asked Tiffers if Hiatus is the name of the TV show that's being shot at her studio. If not, that part doesn't really make sense either. 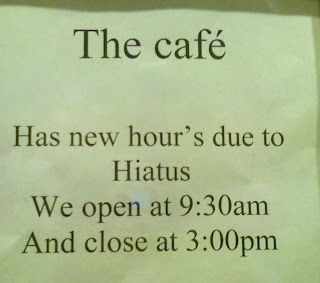 Hahaha... My favorite part of this is the HUGE and unnecessary space between "The cafe" and the rest of the sentence.